The JV girls, varsity girls and varsity boys won their 200 medley relays. In the 200 free relay, the JV and varsity girls took second and the varsity boys took first. Alyssa Huang, grade 10, and Katie Li, grade 10, went 1-2 in the 200 free and Alex Yu, grade 12, won his 200 race. Nikela Hulton and Ysabel Chen, both grade 9, went 2-3 in the 200 IM. Sinaya Joshi, grade 9, set a personal record (PR) and took first in the 50 free. Ethan Hu, grade 11, Rhys Edwards (PR), grade 10, and Matthew Chung, grade 10, went 1-2-3 in the 50 free. Nikela Hulton and Sinaya Joshi went 1-3 in the 100 fly. Arnav Joshi (PR), grade 11, took first in the 10 fly as well. JV and varsity 100 free was dominated by Harker swimmers: first Elizabeth Fields (PR), grade 10; first Jay Thilking (PR), grade 9; second Nicky Kriplani, grade 10; first Ysabel Chen; first Cassandra Ruedy (PR), grade 11; and second Andrew Lu, grade 10. Harker went 1-2-3 in the 500 free with Matthew Chung, Alex Yu and Andew Chang (PR), grade 10. Jay Thilking (PR) was first in the 50 back. Arnav Joshi, grade 11, took first in the 100 back. Andrew Chang (PR) took first in the 50 breast. Last week, the baseball team split a two-game series with South San Francisco. Early in the week, the Eagles lost a tough 10-11 matchup with the Warriors, with Mark Hu, grade 9, driving in three runs. Later in the week, Harker got its revenge with an 11-8 win over SSF, this time with Max Lee, grade 11, and Nick Coulter, grade 10, each driving in three runs. This week, the Eagles travel to Terra Nova on Tuesday, Westmoor on Thursday and Harbor on Saturday. The softball team won both of its games last week against league opponents. First, the Eagles defeated Notre Dame San Jose 13-5 with Cameron Zell, grade 12, exploding for four hits and five RBIs. Later in the week, the Eagles took down El Camino 14-11, this time led by Natasha Yen, grade 10, who drove in three runs on four hits. This week, the girls host Gunn on Monday before traveling to Menlo Atherton Tuesday and Palo Alto on Thursday. Freshmen Alexa Lowe and Andrew Chen each had outstanding performances in their 100-meter and long jump events on Saturday. Both set personal bests in their long jumps. Frosh Brittany Shou threw a lifetime best in the discus, improving by four feet to 64’7″. Zoey Rosa, grade 11, ran both the 100- and 300-meter hurdles, in which she set a new personal best. 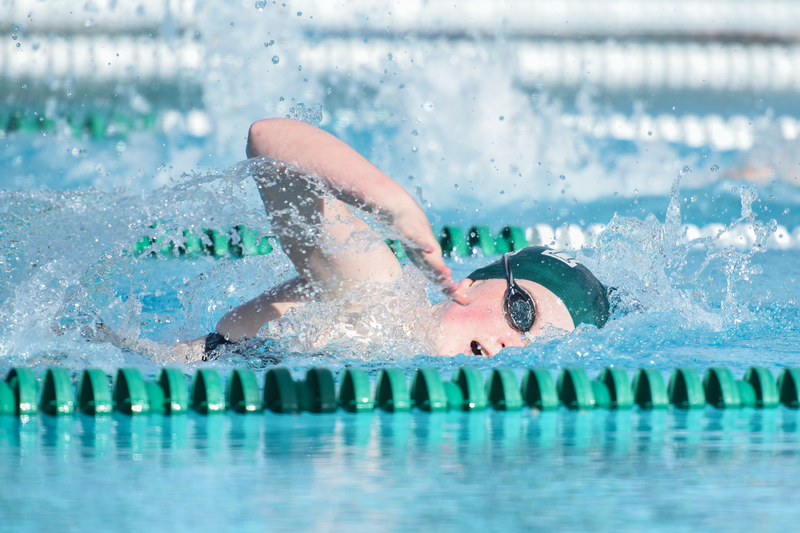 The team competes in its last WBAL meet this Tuesday at Menlo. After a few weeks off, the boys tennis team is back in action against Menlo on Monday and Pinewood on Wednesday to finish up the regular season. The boys golf team defeated Sacred Heart Prep 199-215 last week with Bradley Lu, grade 12, earning medalist honors with a 35. This week, the Eagles face off with Menlo on Friday. The boys volleyball team continued its winning ways last week with a 3-0 win over Mountain View. This week, the Eagles travel to Saratoga on Friday. Last week, the lacrosse team picked up its fifth and sixth consecutive wins as it defeated Mercy Burlingame 14-5 and Sacred Heart Prep 9-8. The 8-2 Eagles travel to Presentation on Tuesday and Woodside on Friday.